A slightly moving, twitching, wagging tail is a sign that your cat is interested in something. Feline communication is largely nonverbal, although from time to time cats may use special noises — like howls, chirps, growls, hisses and meows — to get their point across. In various ways, though, your cat talks to you all the time. Do you understand what she’s saying? It can be difficult for us to pick up on the subtle cues that indicate when our cats are feeling upset or anxious. The warnings cats give are not always glaringly obvious to the untrained eye. Unfortunately, this means that they may be overlooked as insignificant until the cat progresses to more overt signs of distress, like panicked attempts to fight or flee. Because feline communication signals are easily misread — or missed altogether — cats are often incorrectly labeled as temperamental and moody. In order to help avoid stress and conflict, it is important that you learn to listen to your cat. While certain behaviors can serve as clues to your cat's state of mind, none of them should be interpreted in isolation. It’s best to look at multiple signals to help assess how your cat is feeling. 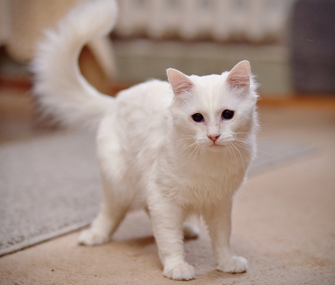 Cats may also send mixed signals if they are unsure of a situation — so your cat's eyes and ears may say “I’m relaxed” but her tail and body posture may tell you otherwise. Once you know what to watch for, you’ll find your cat is almost constantly speaking to you. Here are five common ways your cat talks to you and what she’s trying to say when she does. Your cat’s tail can help you gauge how she is feeling in a given situation — anywhere from relaxed and comfortable to frightened and agitated. It’s important to have a good sense of your cat’s average temperament, measured by the height at which she carries her tail when she is relaxed, in order to judge when she is feeling anxious or uneasy. When a cat is content, she will typically hold her tail out loosely behind her. When she’s happy, she may hold it high, with a slight twitch or curl forward. A slightly moving, twitching, wagging tail is a sign of interest; you may see this when your cat is intensely watching a bird through the window or playing with a toy (especially right before she pounces on and bites the toy). Always pay close attention to a moving tail — it can help give you an idea about a cat’s degree of stress or anxiety in a situation. When your cat becomes agitated, she may move her tail in a way that is faster and more forceful. This type of movement is a sign that she’s overwhelmed by the situation and is not enjoying it. If your cat is concerned about a situation, she may also lower her tail and wrap it underneath her body or around her side if she is lying down. And the bristled out, stiffly held tail that we associate with Halloween cats isn’t just your kitty trying to look scary — it’s a sign that she’s actually terrified. A cat’s ears are loaded with information. When your cat’s ears are forward and slightly to the side, she is probably feeling relaxed. When your cat is really interested and excited, her ears may be pricked forward. Your cat’s ears may pivot some as she follows a sound, but fast-twitching ears may be indicative of nervousness and uncertainty. A cat who is fearful or agitated may move her ears back toward her neck and pin them tightly against her head or move them out to the sides so that they resemble airplane wings.